Go to the "Our products " page to select the product of your choice. Then, just add it to your basket. Once you have made your choices, click on the basket at the top right hand corner of the page and follow the process to complete the order. The total cost of your order includes the price of the articles ordered and delivery costs. Once you are ready to complete your order, click on the "order" button. You will be redirected to the payment page. For every order placed, we offer you 2 samples of our mini products. You can choose which you would like to test! The 4 available samples are: the Body Cream, Face Cream, Shower Oil and Nail Care Pen! 2. How can I find out if the products are available? When you choose a product, you can consult the details on its page. Stock on the site is updated in real time; only available products are displayed. 3. I made a mistake, I would like to change or cancel my order. Is it possible? You can change the billing or delivery address in the Your Orders section of your account. Important: if your order has been validated, it cannot be modified: your order is processed as soon as it is received. We cannot therefore cancel or change it. 4. How can I find out if my order has been received? 5. When will my order be dispatched? Delivery generally takes 2 working days for any order placed and confirmed before noon. This deadline may vary depending on the delivery method chosen. 6. How does the gift card work? Do you want to offer MÊME products to family/friends but you're not sure what they would like or need? Then a gift card is the perfect solution! A 100% affectionate and personalised idea, which will allow the person receiving it to choose the gift they want. The MÊME gift card can be used to purchase any product on the memecosmetics.fr website, is valid for one year and can be used multiple times! 4/ You can choose to print the gift voucher and deliver it by hand or send it directly by email: just enter the recipient's email address in the corresponding field. You can even choose to send it on a specific date for a special occasion! 5/ Add the gift card to the basket and once your payment has been confirmed you can give your MÊME gift card! 6/ The lucky recipient will simply have to fill in the code when they confirm their basket! 1. Where does MÊME deliver? When you place your order on the Même website, you can have it delivered to (almost) anywhere in the European Union. Refer to section 3 below for the full list of Delivery Zones! 2. What are the delivery methods? Delivery by Colissimo without signature (only in France): your parcel will be delivered within 1 to 2 working days depending on the order date. 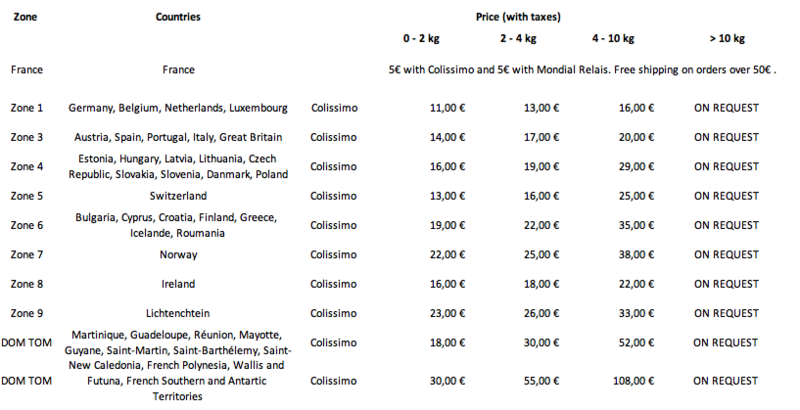 Delivery by Colissimo Europe or International: your parcel will be delivered within 3 to 5 working days depending on the order date. Delivery by Mondial Relay (only in France): Choose the pickup point nearest to your home and your parcel will be delivered there within 1 to 2 working days. You will be informed by email that your parcel has arrived. 3. What are the delivery costs and times? 4. How can I track delivery of my order? Once your order has been confirmed, you can track it directly in the "my orders" section of your account. Once your parcel has been dispatched, you will also receive a parcel tracking number. This will allow you can track it until arrives at its final destination! 5. What happens if no one can collect my parcel? If you or the recipient of the parcel is absent during delivery, a delivery note will be left in your letter box indicating the next delivery date or where the parcel can be collected. If you cannot collect your parcel within 7 days, as from the delivery date, it will be sent back to us and we will refund you. 6. An item is missing from my parcel or an item is damaged: what should I do? If an item is missing or damaged, please contact us so we can take the necessary measures together. 1. I don't remember my username and/or password? You can reset your password on the log-in page by clicking on "Forgotten your password?". You will receive an email with a link allowing you to change your password. You can also contact us by phoning +33 (0)9 86 53 19 69, Monday to Friday from 10 a.m. to 12 p.m. and 2 p.m. to 6 p.m. Our customer service will help you to unblock your account. 2. How can I change my account details? To change your account details, log in and go to "my address book" or "my details"
3. How can I sign up to the newsletter? To sign up for the newsletter, go to our homepage and click on the link "Newsletter" in the top right-hand corner of your screen, or at the very bottom of the page. 4. How can I unsubscribe from the newsletter? If you want to unsubscribe from our newsletter, go to the "my personal details" section of your account and untick the box "let us spoil you by subscribing to our newsletter". Otherwise, you can unsubscribe by clicking on the link at the bottom of each newsletter email. 5. How is the personal data on my account used? You can have a look at our confidentiality policy! PayPal, bank transfers and cheques. 3 - Once your payment has been confirmed you will automatically be redirected to memecosmetics.fr to complete your order. 2. Are card payments secure? Our site features an encryption system (SSL) to protect all data related to personal details and payment methods. Moreover, cardholders are also subject to verifications and an authorisation from the card issuer. If the card issuer does not authorise payment, unfortunately we cannot accept your order. 3. What should I do if my payment is declined? The payment method you have chosen may be declined for various reasons. 1/ Expired Card: Check that your card has not expired. If this is the case, your card is no longer working and you should therefore request a new card. 2/ New card: If you use your card after a renewal, ensure that it has been activated at your nearest ATM! 3/ Error in PIN code: If you have wrongly entered your PIN code it is possible that your card has been automatically blocked. You should therefore contact your bank to have it replaced. 4/ Maximum spending limits: If you have made numerous purchases recently, check that you have not exceeded the authorised payment limit applicable to your card. Your bank can suggest a more suitable formula for your expenses by increasing your spending limits. If none of the above apply to you, contact your bank to find out why payment has been blocked! 1. How can I return an article ordered on the website? As MÊME products are personal care and cosmetic products, unfortunately, they cannot be returned, see our Terms and Conditions of Sale. If you encounter a problem with your parcels, contact Charlotte from our customer service, she will be happy to help you. Contact her directly by clicking here! 1. How does the "refer a friend" system work? Win a €5 discount voucher for you and your friends by recommending MÊME products! It's quick and easy. In the "Refer a friend" section of your account, simply fill in the surnames, first names and email addresses of your friends in the space provided. When one of them places an order, he/she will receive a €5 voucher by email and so will you! 1. Are MÊME products also suitable for people who are not undergoing treatment for cancer? Our products are carefully formulated, and as a precaution any potentially harmful ingredients associated with cancer or hormonal imbalances are removed. These formulae, designed for extremely fragile individuals, can evidently be used by people in good health, who also want to pay close attention to the ingredients in their cosmetics. 2. How long can a product be kept for once it has been opened? The PAO, i.e. Period After Opening, is indicated on all of our products. All products feature a pictogram representing an open container indicating the recommended period of use once the packaging is open. In general, this period varies between 6 months (6M) and 24 months (24M). 3. Are MÊME products tested on animals? We do not test our products on animals and respect regulations in force. The European Cosmetics Regulation in force since 11 July 2013 prohibits such methods for both raw materials and products. When developing our products, we select our raw materials with great care in order to choose those that have not been tested on animals. 4. Where can I find the ingredients? You will find the list of ingredients on each product sheet, under "Ingredients". To ensure that you can understand the formulae of our products and use them with confidence, we go beyond regulatory obligations by sharing as much information as possible with you regarding the role and origin of each of our ingredients. You will find this additional information by moving the mouse over the list of ingredients. 5. What tests have been carried out on the products? All of our products have been the subject of a large scale clinical trial carried out in the Centre de Lutte Contre le Cancer Léon Bérard (Lyon) and Jean Mermoz private hospital (Lyon). Internationally-renowned oncologists were able to assess tolerance, efficacy and the improvement in quality of life offered by the MÊME products, on 70 women undergoing cancer treatment. You can find the results and the scientific publication of the clinical trial on the "Our promises" page of the website.